Carol Laidler and Pat Jamieson are members of alldaybreakfast, a Bristol based artist collective working within the area of Situated Art. They are also members of the Travelling Language Gallery, a site responsive writing and performance group. We are interested in how content and context impact upon each other to produce new meaning. We use the landscape as a frame for a series of textual interventions and explore how these elements relate to each other. We are currently in the process of working on a series of exterior word trails about water focusing on the particular geographical and historical location of different rivers for a series of personal interventions, interrupting the expected order of the place. Whilst the River Frome (WATERMARKED) has been safely culverted and concreted over, the River Exe (WATERLINE) represents the power of water, the tension and drama between the system of flood defences and the swelling of the river. 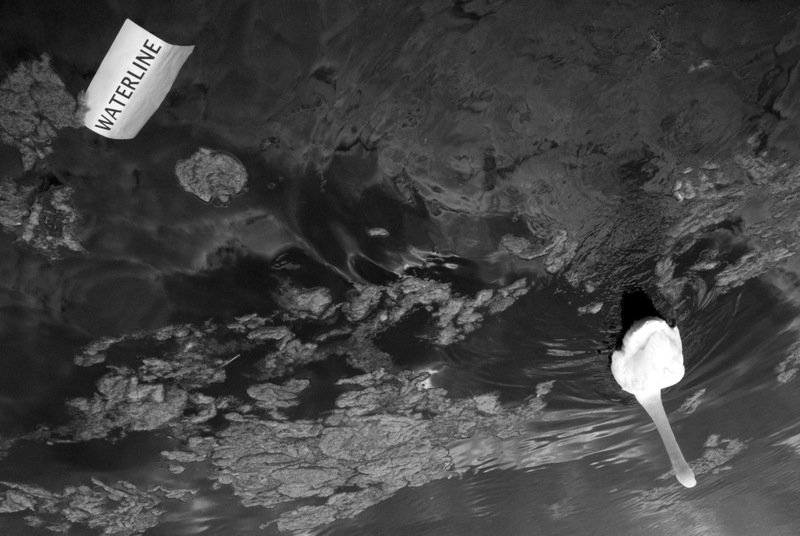 WATERLINE is a ten mile long paper trail, a ‘poem’ to be discovered along a walk. It is a metonymic practice, which involves examining the connection between things. Do these narrative connections emerge from the search for meanings that have some resonance to our own experiences? We have an almost magnetic connection to water. It resonates with our saltier selves, our amniotic beginnings, bodily fluids, unplumbed depths that lie beneath the surface. In our dreams we feel the call of the voyage, the lure of the elsewhere.